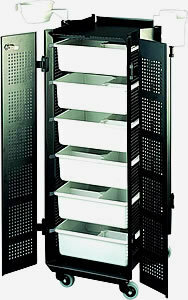 Efalock Piccolo 5001 Safe Trolley. A locking trolley in black and white with 6 drawers, tint bowl holder and pin holder. Sizes: Height 83cm, Width 36cm, Depth 40cm.